Destroy the asteroids that are surrounding the galaxy. Free the planets form darkness and bring back the glory that the galaxy once had. Every stage has five levels, by clearing the previous level, the next one is unlocked. To play the levels, you need to have an Energy Orb. You can have up to five Energy Orb at once, and they regenerate in time. There are two different play modes. You can tell by the icon in the top right. The controls are the same. Each level has objectives that must be achieved to clear the level. Read them carefully before playing. If you clear the mission, the next stage will be unlocked. If not, an energy orb will be taken from you. If you have added your friends via facebook, your friend's UFO will come to help during play. You can earn your very own UFO by inviting 5 friends or by purchasing one. You can upgrade and make it stronger. Connect three or more if the same colored asteroids. You have a time limit, so be careful. By connecting fire, you will produce Bomb Asteroid. Bomb Asteroids can be destroyed the same way as the others: but, when Bomb Asteroids are destroyed they produce a large explosion wrecking whatever is in its radius. Connect eight or more you get a black hole. Black Holes will erase all of the asteroids of the same color when being destroyed. When you connect two black holes, you can erase everything nearby. Each planet has a " capacity or how much asteroids it can have present at one time. If you can't keep up with the rising number of asteroids and reach the capacity, you will fail the mission. The left indicates the current amount of asteroids present and right is your capacity. Each stage also has a time limit you will have to pay attention to along with the capacity to clear the mission. When you clear a mission, your score will determine what how many stars you get. Three is the highest. Exit your Million Asteroids app. Change the time of your device. 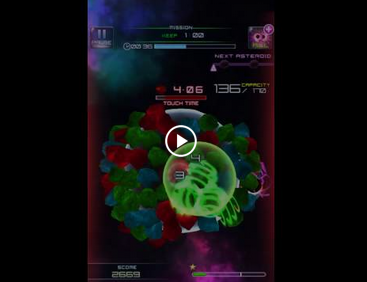 Open Million Asteroids app, check if you have a full energy orb. If you plan to go back at your real time, you must have a full energy orb to be able to change your time back without problems.